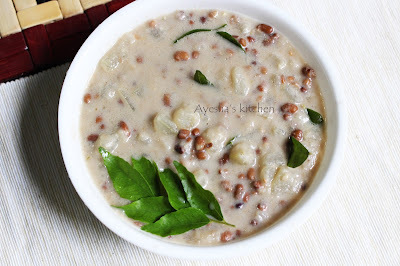 Kerala olan recipe is one of the popular and traditional dish in Kerala Onam sadhya ( feast ) with ash gourd and cowpeas. Here no spices are added but the dish simply tastes yummy only because of the flavor of coconut milk. Ash gourd (kumbalanga )and cowpeas (van payar) are stewed in coconut milk which is served as an accomplishment with rice for sadhya. Some other Kerala sadya recipes are pachadi, kaalan, erissery, pulissery, payasam, koottu curry and so on. 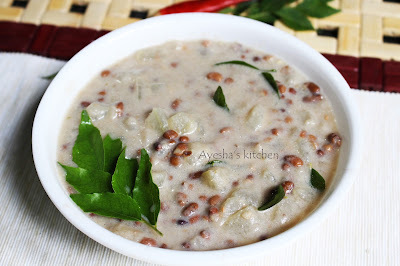 So let's see how to make Kerala style Olan recipe with ash gourd and cowpeas. Soak the cowpeas for 4 hours and then pressure cook it until done. Remove the skin from ash gourd and chop into small pieces. Now add this chopped ash gourd to the cooked cowpeas along with green chilies, salt, and thin coconut milk. Let it cook until the vegetables are done. When done, add the thick coconut milk and reduce the flame. Stir slowly until the mix is cooked well and remove from fire. Season with coconut oil and curry leaves. Mix well and cover it for few minutes. This makes the dish more flavorful.